There was always something about board games that stressed me out as a kid. It always felt like everyone else really knew what was going on and I was just winging it. It’s a big difference to playing them as an adult. Now whenever we get a new game I’m always put in charge of the directions and need to absorb them in a way that lets me explain them to all of the other players. Today’s Maximumble is out of breath. Wait… Is EvilBiff cheating at Chutes and Ladders..?! I guess I can assume Biff is a bad loser. Sooooo, it gives Evil Biff confidence to destroy…even himself. Now that I think about it, that is TOTALLY evil. Evil Biff has jacket that reminds me of old country. In Soviet Russia, games play you! So in all confidence, your STILL winging board games cause ya dont know what to do, even as an adult? My older brothers were too lazy to read the rules. So I was the one explaining the rules to them. I won a lot of games. I don’t get it. How does Biff get a boost of confidence by destroying his own robotic clone? @Benpercent; Didn’t you know that victory over one’s own self is the most complete victory of all..? 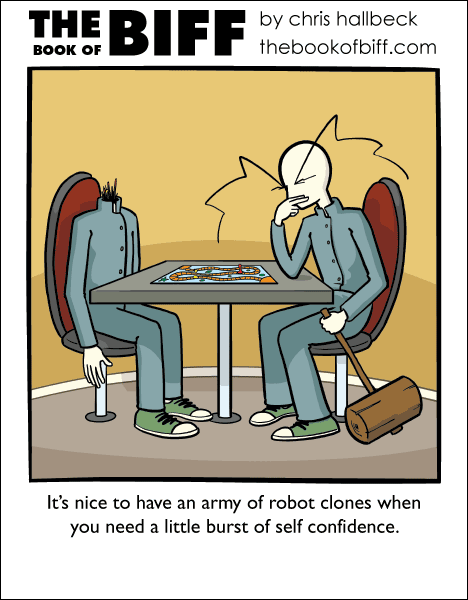 Nohing like total victory to boost one’s confidence, and since it’s an EvilBiff robo-clone, he must’ve out-eviled it, and out-cheated it too – Rather masterful, that! …I do believe googling random phrases has led me to a new, highly entertaining webcomic. I am greatly satisfied with my scavenging hunt for today. @Smile – what did you google?